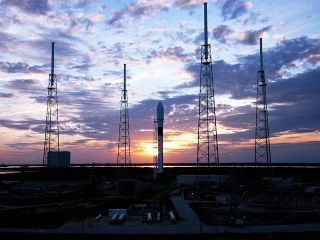 Here, SpaceX's first Falcon 9 rocket is backlit by a Florida sunset during its first vertical perch atop a Cape Canaveral Air Force Station launch pad in Jan. 2009. This story was updated at 12:45 p.m. EDT on Sept. 12. WASHINGTON — Space Exploration Technologies (SpaceX) Corp. acknowledged that its Falcon 9 rocket experienced an engine anomaly during its December launch of the company’s reusable Dragon space capsule. It does not, however, present an obstacle for cargo delivery missions to the international space station, SpaceX said. Indeed, despite the engine anomaly, Falcon 9 successfully delivered Dragon to orbit during the Dec. 8 mission, an orbital demonstration flight conducted under NASA’s Commercial Orbital Transportation Service (COTS) program. SpaceX spokeswoman Kirstin Brost Grantham said that the anomaly poses no threat to the company’s upcoming COTS demonstration, a flight to the international space station (ISS) targeted for late November. If that flight goes well, SpaceX would begin making periodic supply runs to the ISS under a $1.6 billion contract NASA awarded the Hawthorne, Calif.-based company in 2008. During the August meeting, held at the Johnson Space Center in Houston, SpaceX told the two advisory bodies that there had been an engine anomaly during the most recent Falcon 9 launch, said Charles Daniel, a shuttle and space station safety expert at Herndon, Va.-based Valador Inc., and a member of the ISS Advisory Committee. SpaceX disputes Daniel’s characterization of the engine anomaly as a premature shutdown. “We did not have a premature engine shutdown,” Bowersox told Space News. Bowersox also said SpaceX informed NASA of the engine anomaly right away. SpaceX spokesman Robert Block said that NASA received a briefing about the flight Dec. 15. SpaceX subsequently delivered full-rate telemetry for the flight on Dec. 28. A full flight report to the agency followed on Feb. 24, Block said. The company Daniel works for, Valador Inc., was sued in June by SpaceX in Virginia’s Fairfax County Circuit Court. SpaceX brought the suit forward after another Valador vice president, Joseph Fragola, made what SpaceX said were defamatory statements about the safety and reliability of the Falcon 9. The suit was settled out of court in early August. According to SpaceX’s complaint, Fragola on June 8 emailed Bryan O’Connor, then NASA’s chief of safety and mission assurance, saying he was trying to verify a rumor that the Falcon 9’s first stage experienced a significant anomaly during its Dec. 8 mission. “I have just heard a rumor, and I am trying now to check its veracity, that the Falcon 9 experienced a double engine failure in the first stage and that the entire stage blew up just after the first stage separated. I also heard that this information was being held from NASA until SpaceX can ‘verify’ it,” Fragola wrote O’Connor, according to court papers. Neither Fragola nor Valador have publicly identified the source of the rumor that prompted Fragola to contact O’Connor.